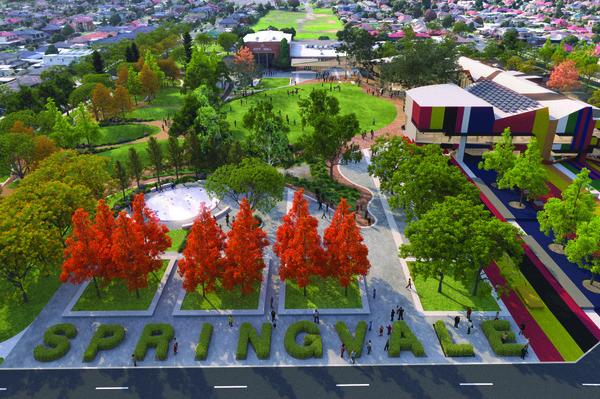 An artist's impression of the redeveloped Springvale civic precinct. Springvale’s new community hub design will be changed to house child care. At their Tuesday 13 June meeting, Greater Dandenong Councillors agreed to adjust the existing building plan at a cost of about $80,000 so it could accommodate an occasional childcare service. This report was in response to a request from Cr Roz Blades in January. She asked council officers to look into the need for child care in Springvale, potential benefits to the community, the feasibility of including the service in the hub, and different options. Their investigation found capacity to expand meeting rooms four and five to accommodate occasional childcare by providing required amenities in the neighbouring room, currently earmarked for storage. “Any service would need to be run by an external provider or agency on a user-pays basis,” the report said. Cr Sean O’Reilly said parents in the community had the right to access education. “I know as a parent myself, sometimes you just need that break,” he said. The $40 million Springvale Road project will replace the former Springvale council chambers, and is due for completion by early 2020. It will include a new library, multi-purpose community meeting spaces, outdoor green spaces and parking.